Monthly Review Press has kindly given permission to Links International Journal of Socialist Renewal to publish an excerpt from Revolutionary Doctors: How Venezuela and Cuba are Changing the World’s Conception of Health Care by Steve Brouwer. You can download the excerpt HERE (PDF), or read it on screen HERE. 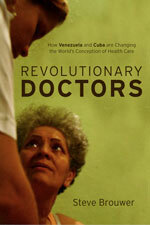 Readers of Links are also urged to purchase copies of Revolutionary Doctors. Those in Australia can order copies from Resistance Books; in other parts of the world, please click HERE to order. New York, Monthly Review Press, 2011, 245 pp. September 22, 2011 – Submitted to Links International Journal of Socialist Renewal by Don Fitz -- As Venezuela becomes the first country to reproduce the Cuban medical model on a massive scale, it is doing so in ways that are unique in both form and process. Steve Brouwer’s Revolutionary Doctors: How Venezuela and Cuba are Changing the World’s Conception of Health Care is essential reading for anyone interested in the transformation of medical systems at a cost vastly less than in the US and other overdeveloped countries. Readers knowledgeable of developments in Cuba and Venezuela, as well as those first learning about them can discover from Brouwer’s insights how medicine intertwines with national and international politics. Revolutionary Doctors builds upon the growing body of information about medicine in Cuba. Some of the best recent writings include Linda Whiteford and Laurence Branch’s Primary Health Care in Cuba (2008) and John Kirk and Michael Erisman’s Cuban Medical Internationalism (2009). Together, the three works show how the Cuban model grew by responding to a series of contradictions. The first contradiction was the enormous disparity in the quality of medical care between rich and poor, urban and rural, and light-skinned and dark-skinned Cubans that characterised the island in the 1950s. The revolutionary government immediately devoted itself to increasing the number of hospitals throughout the island. Third, Cuba was probably the first country in the world to recognise that clinics, though invaluable, do not create the close contact between health professionals and patients that is essential for genuine preventive care. In the 1980s the Family Doctor Program began Basic Health Teams (BHTs), which are a doctor and nurse duo living at the small medical office, or consultorio, in the community they serve. The most revolutionary concept of Cuban medicine is family doctors being responsible for everyone in a defined geographical area. Unlike the first three contradictions, that of the 1990s was 100% external in origin. The fall of the Soviet Union, the crash of the Cuban economy and embargo bills that passed the US Congress left the island with much less energy, food and medicine. Hardships were extreme: young men lost 25% of their caloric intake and nutritional deficits, leading to 50,000 cases of optic neuropathy. But Cuba trained four times more doctors during this decade than it did during the 1970s. Amazingly, rates of infant mortality continued to fall (pp. 63–65). Polyclinics and consultorios had become so much a part of Cuban life that the island was able to weather the economic storm. The fifth contradiction was Cuba’s understanding that socialized medicine could not be realized in one country alone. Though international medical humanitarianism spanned 50 years of revolutionary change, it was the first decade of the 21st century when it grew by leaps and bounds, with international medical brigades responding to crises throughout the world and over 20,000 students from 100 countries coming to Cuba for free education to become doctors. The Cuban concept of medicina general integral (MGI, comprehensive general medicine) defines the Family Doctor Program put into effect in the 1980s. Building close doctor-patient relationships means seeing patients in the morning at the consultorio and making home visits in the afternoon. Venezuela’s Barrio Adentro (inside the neighbourhood) program is likewise based on this concept of medical professionals living in the same communities as their patients. Its foundation was laid with the October 2000 agreement signed by Fidel Castro and Hugo Chavez, which included Venezuela pledging oil and other goods and Cuba providing human resources: teachers, agronomists and medical professionals (p. 81). Though 17 of 24 million Venezuelans had no regular access to medical care when Chavez took office in 1998, in 2003 the first wave of 2000 Cuban doctors arrived to help extend care to every corner of the country. By 2009, 14,000 Cuban doctors had participated (p. 89). Like Cuba’s MGI model, Venezuela’s medicina integral communitarian (MCI, comprehensive community medicine) begins by recruiting thousands of students, who go to medical school for six years. They observe doctor/patient interactions beginning with their first year. In addition to treating people in their communities, the MIC program trains doctors in village settings. Some Venezuelan students are mothers and Brouwer describes one who began medical school at 71 years of age (p. 131). Barrio Adentro I began in 2003 with a massive expansion of neighbourhood consultorios populares. In 2004, the Chavez government initiated Barrio Adentro II, which supported the mushrooming consultorios populares with a system of Clinicas diagnosticas integrales (CDIs, comprehensive diagnostic clinics). CDIs have a variety of specialists, analytic equipment and treatment alternatives not available at neighbourhood settings (p. 87) . The following year saw the introduction of Barrio Adentro III, which attempted to overhaul Venezuela’s complex maze of hospital systems. In 2007, Barrio Adentro IV began the construction of specialty hospitals (p. 91). One of the most striking differences between health-care metamorphoses in Cuba and Venezuela is their time frames. Each major shift in Cuban medicine marked a decade. A year was devoted to the corresponding modifications in Venezuela: 2003, 2004, 2005 and 2007 for initiating Barrio Adentro I–IV. Brouwer notes the inevitable conflicts and problems that accompanied such rapid transformation. It is not surprising that a course which takes decades to chart can be recreated much more rapidly. But it is not obvious that stages of the process may be reversed in doing so. It took three decades for Cuban medicine to evolve from focusing on hospital care and polyclinics before hitting upon the MGI concept of the Basic Health Team. Once the Cubans realised that a doctor-nurse duo living in the community should be the cornerstone of community health, the Venezuelans used it as the beginning point of the Barrio Adentro program. After massive expansion of consultorios populares as their first step, the Venezuelans built more clinics to strengthen neighbourhood health and then overhauled their hospital system — they modified their medical systems in an order opposite to what Cubans had done. Of course, many other differences affected conversions of health systems in the two countries. With 11 million residents, Cuba has a much smaller population on an island which the US yearns to isolate. When the vast majority of naysayers departed Cuba, it was able to develop a cohesive approach to health care. Venezuela, by contrast, has the continued presence of large anti-revolutionary forces using the media they control to issue shrill denunciations of any progressive change. Despite these differences, there are many parallels between revolutionary medicine in Cuba and Venezuela, beginning with doctor-nurse teams living in areas served. As in countries throughout Latin America, established physicians were highly reluctant to practice medicine in poor barrios or rural areas. The revolutionary government needed to train thousands of doctors who would themselves go to areas most in need, as Che Guevara said, “immediately and with unreserved enthusiasm to help” their sisters and brothers. The beginning point of revolutionary medicine is a new generation of doctors motivated by revolutionary consciousness. These doctors work, not to become wealthy, but because they find their efforts rewarding and meaningful for their patients’ lives. This concept is empty rhetoric at corporate Western medical schools that churn out doctors who glare in hostility at physicians willing to live in impoverished communities. Cuban and Venezuelan governments quickly increased spending on medicine in the poorest areas, resulting in rapid reductions in infant mortality and infectious diseases, and increases in life expectancy. These improvements could only occur because Cuba and Venezuela realised that improving medical care presupposes simultaneous improvements in literacy, education and housing. US doctors not seeing patients until they are sick are symptomatic of “sickness-based” medicine. When Brouwer described statistical charts on the walls of a consultorios popular in Venezuela, I remembered the same types of charts I saw in a Havana consultorio. Charting behaviours that need to change reflects the “wellness-based” medicine of doctors who are familiar with their patients because they interact with them informally throughout the year (p. 97). Each neighborhood of 1,500 to 2,000 people that wanted a Cuban doctor to serve them was expected to organize a committee of 10 to 20 volunteers from the community who would commit themselves to finding office space, providing sleeping quarters, collecting furniture and simple fixtures, and feeding the medical providers (p. 84). Venezuela is now emulating Cuba’s example of training doctors from other countries at its medical schools (p. 140). If the Cuban MGI model morphed into MIC in Venezuela, what new concepts will be born in countries of Latin America, Africa and the Caribbean? We can be sure that they will not rely on expensive technologies of Western “sickness-based” medicine. We also know that they will not be static repeats of Cuba or Venezuela but dynamic recreations of medicine for the cultures they serve.